Others include the Catholic campaigner Daphne Macleod (of Pro Ecclesiae et Pontifice), Prince Rupert Lowenstein (President of the British Order of Malta and of the LMS), the theologian Catherine Pickstock, the novelist Piers Paul Read, and Damien Thompson, the Editor in Chief of the Catholic Herald. The full text of the petition and the signatures are here. Hat-tip to The New Liturgical Movememnt. Mr Julian Chadwick, esteemed Chairman of the Latin Mass Society, celebrated his 50th birthday with a Mass and party at the London Oratory on Thursday. 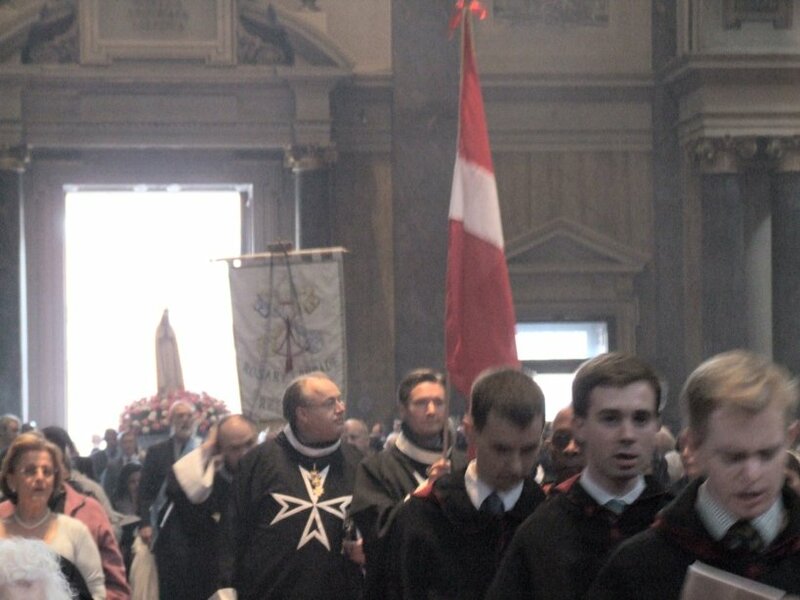 Here's a picture of him in the same place, during the Rosary Crusade, wearing the choir robes of the Order of Malta, of which he is a Knight of Magistral Grace; hat-tip to Hermeneutic of Continuity for this picure. 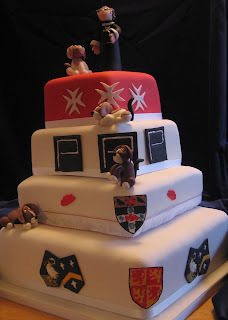 IMHO, however, even better is Julian rendered in sugar-dough for his cake, which also shows him in his robes, accompanied by beagles (he is Master of a beagle hunt near Newbury), the Maltese Cross, the logo of his law firm, Penningtons, and the coats of arms of his county of birth and alma maters (school and college). A feast of heraldry, in fact. Well done to Lucy Shaw Cakes. And many happy returns to Mr Chadwick! ```The New Liturgical Movement blog has published this 'DECLARATION SUPPORTING ANY PAPAL INITIATIVE TO ALLOW THE FREER USE OF THE 1962 MISSALE ROMANUM'. You can sign up too, here. This is designed to parallel, for the English-speaking world, the similar declarations made in recent weeks by intellectuals and writers in Italy, France and Poland. Among the luminaries, from all parts of the Anglosphere, Britons who have already signed this include James Bogle, Fr Tim Finnigan, Dr Laurence Hemming, Fr Aidan Nichols (of Oxford University), Dr Susan Parsons, Joseph Pearse, Alcuin Read, and me! The declaration recalls the petition presented to Pope Paul VI in 1971 to allow the continued use of the Traditional liturgy, which resulted in the 'English Indult'. This petition was signed by many prominent writers and intellectuals, by no means all Catholic, who saw the disappearance of the Traditional Catholic liturgy as a cultural calamity affecting the whole of society. The petitioners included Agatha Christie, Cyril Connolly, Kenneth Clark, Graham Greene, Cecil Day Lewis, Malcolm Muggeridge and Iris Murdoch. Well done to Shawn Tribe of the New Liturgical Movement for organising this new declaration, and may it stiffen the resolve of the Holy Father in carrying his policy towards the Traditional liturgy into effect. On the 21st December there was a splendid Traditional, Sung Nuptial Mass celebrated in the Oxford Oratory; the celebrant was Fr Richard Duffield. 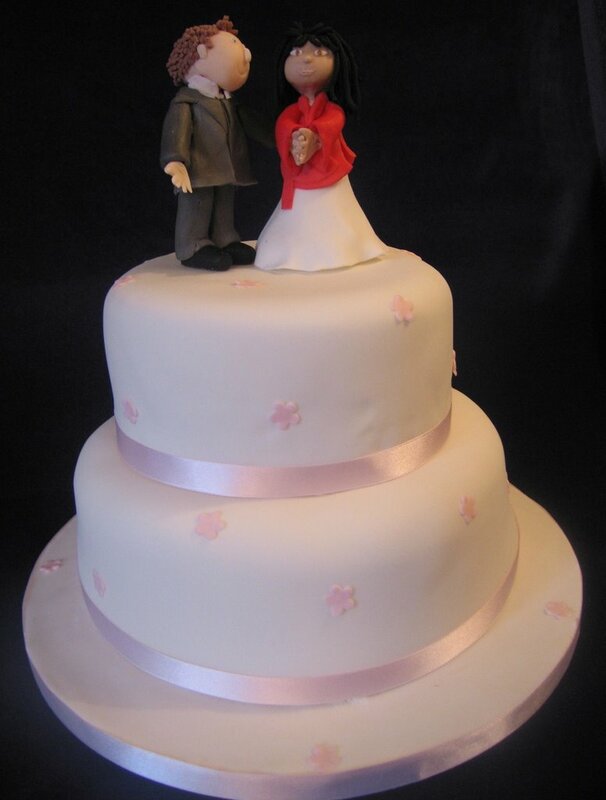 Please pray for the Happy Couple: their friends will recognise them from the cake! The cake was made by Lucy Shaw Cakes. This rather grainy video was taken with an ordinary digital camera from the choir loft, and shows the consecration; note the newly married couple kneeling before the Altar. The time gap between the priest's actions and the sound of the bell is attributable to the distance from which the video was taken, not any slowness on the part of our servers! As well as the very beautiful ceremony of the Vows and the Blessing of the Ring(s), the Traditional wedding service has special blessings of the bride and groom (actually, just the bride) which the celebrant makes after the Pater Noster. And I say: Amen to that! Fr Crowdy died on Friday 8th December at 3pm. Fr Boyle was with him. He wished to be buried at St Saviour's in Bristol. Requiescat in pace. 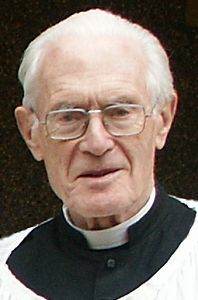 Please pray for Fr Crowdy, who said the Traditional Mass in Oxford for many years. For his obituary, see here.